Connection Heads and Thermowells Also Available. Replacement RTD probes are available in two configurations, fixed length for direct immersion or spring loaded for use in thermowells (allows for good contact with the bottom of the thermowell). Each probe features #26 AWG stranded nickel plated copper, PFA insulated wires (2 black, 1 red) 6" long standard. These probe assemblies can be used as replacement sensors for our PR-12, -14 and -18 RTD sensor assemblies, used as is, or combined with our optional thermowells and connection heads to design your own sensor configuration. When ordering fixed length replacement probes, the length of the probe is specified from the tip of the probe to the full engagement point of the 1/2NPT thread (which is typically 1/2" as shown). 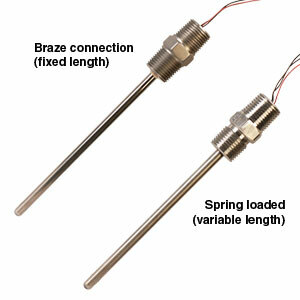 Note: If being used in a thermowell, typically spring loaded probes are recommended. Otherwise, the thread engagement must be taken into account to insure that the sensor is not damaged by contacting the bottom of the thermowell bore during installation. When ordering spring loaded replacement probes, the length of the probe should be specified as the immersion length of the thermowell it will be placed into. The immersion length is the distance from the top of the thermowell to the bottom of the bore. Spring Loaded probes are used to insure that the probe bottoms in the thermowell, and that a small amount of force is present to insure that this contact is maintained when exposed to process conditions. The actual probe length of the sensor before insertion is a little longer than the immersion length as shown below to allow for a 1/4" spring compression when the sensor is threaded into the thermowell. For 2-wire construction, change “-2” in model number to “-1”, for 4-wire construction, change to “-3” (color code is red/black, black/black/red or black/black/red/red) and add $5 to the price. For special probe lengths, change sheath length in model number to required sheath length in inches, add $1 per inch to the price above 24". For lead wires other than 6" long, add lead wire length in inches at the end of the model number and add $2.25 per foot to the price. For fiberglass insulated lead wires, add “-GG” to the model number and $6 to the price.